By now you’ve seen all the Cars-themed party fun of Kate’s 3rd birthday party, and now here’s a behind-the-scenes look at how it all came together! As I shared in Kate’s 3rd birthday party post, we decided to hold her celebration in a movie theater! Deciding on our venue was the easy part – finding a theater that would actually accommodate us was surprisingly challenging. While calling around to research our options I discovered that Disney/Pixar movies that aren’t currently playing in theaters are locked up in “the vault” and Disney will not release their reels to theaters. I was repeatedly told that our only option for a movie theater party was to have the party featuring a different movie currently playing in theaters. By this point I was pretty committed to the Cars birthday party theme, so I kept on searching and was thrilled to finally find a theater with a DVD player that would let us bring in our own copy of Cars to play on the day! The theater’s only requirement was that we didn’t charge our guests (which of course we didn’t). The party was on, and I was so excited for Kate’s first movie theater experience to be with her favorite movie and all our friends! The challenge with having this year’s party somewhere other than our house is that I only had 30 minutes to set up food and decorations before guests arrived. Considering how short I was on time, I was so grateful to have my sister Amanda and my friend Jill helping me with set-up. I planned out as much as I could beforehand, including the placement of decorations, food layout, etc., and on the morning of the party we loaded up my friend Jill’s minivan (thank goodness for that thing! ), headed to the theater, and raced like crazy people to have everything set up in time. We ran into a snag right off the bat in that I was expecting two large 6′ banquet tables to be set up for food and favors, but we arrived to find two little 4′ long tables barely deep enough to fit a popcorn tub. I had planned everything out for 6′ banquet tables (tablecloths, happy birthday banners, centerpieces, food placement, etc.) so it was definitely a “make it work” moment. The projectionist was the only theater staff person there at the time, but he was so helpful and brought in another little table from their cafe which helped. My original plan was to have all the food on one table and all the favors and beverages on the other table, but in the end we needed all the tables for food and beverages, and I had to keep the party favors boxed up until we handed them out. When you’re having a party somewhere other than your home those little unexpected things are bound to happen, but in the grand scheme of things they’re no big deal – you’ve just got to roll with them! A slideshow of Kate’s first three years played on the big screen as guest arrived. Since we had the whole theater to ourselves we were thrilled to invite all the little kiddos in Kate’s life and their parents. In the end our guest list totaled 70 people (35 of them kids) and we were so excited to celebrate with everyone! Our guests enjoying the Cars movie at Kate’s 3rd birthday party! My sister Amanda greeted our guests at the door and handed out “VIP Pit Passes” to each of the kids as they arrived. She said they were such a hit that even some of the parents were asking if they could have one, too! I was looking online for black and white checkered lanyards, but totally lucked out finding these Cars lanyards at Party City – even better! I saw the “Pit Pass” idea numerous times on Pinterest and loved it. I made mine using Publisher, printed them out on white cardstock, cut, and inserted them into clear name badge holders. I used Lightening McQueen and Mater as the stars of my printables since they’re Kate’s favorite Cars characters. I’m a total germaphobe – a condition exacerbated by public places – which is how I came up with the idea to set up a “Car Wash” hand wash and sanitizing station – “free with fill-up!” so guests could clean up their hands before and after they ate without having to leave the movie. I brought our hand sanitizer pump from home and slapped a checkered label on it, and set a package of baby wipes (it just so happened the Target brand baby wipes were the same blue as Kate’s party colors) placed in a red metal bin that we already had. Car Wash & Sanitizing Station – Free with Fill Up! Instead, in a “make it work” moment, I tied each set together into one long banner and hung them at the front of the theater underneath the screen (as seen in our original Cars Birthday Party post). Similar to the “Kate is 3” signs above, her birthday banner was made with white printed cardstock, cut out and glued over blue cardstock – both in the shape of the classic Route 66 sign. I used a little hole punch in the corners and red ribbon to tie them all together. One of my favorite parts of Kate’s birthday party last year was surprising the little ones with a grand entrance – something I was excited to do again this year! My first idea was to line the entrance with safety cones. I used Lightening McQueen and Mater on most of the party printables since they’re Kate’s favorite characters, but I really wanted to incorporate the rest of the gang somehow, so I decided to add pictures of all the Cars characters to each of the cones. I originally wanted to line the hallway with large racing flags hanging at an angle as the kids ran through but I wasn’t allowed to hang anything from the walls, so I decided to have them sticking out of the tops of the safety cones instead. As we were getting closer to Kate’s party date she asked me if we’d have balloons at her party. At the time I wasn’t planning on using balloons (since we did so many last year) but Kate really loves balloons so I decided to add them to the cones to bring some additional height, drama, and color to the entrance. The end result was a Cars character and balloon-lined entrance into the theater that was a major hit with the birthday girl and all her friends! Our safety cone, race flag and balloon-filled entrance for Kate’s Cars birthday party – all set up and ready for transport to the party! Those balloons were probably my biggest source of stress when it came to this year’s party planning. Those of you who follow me on Facebook and Instagram already know about my deflating drama, but for the rest of you here’s the scoop: I had “tester” helium balloons filled at Party City a couple of weeks prior to the party – some with Hi-Float added (which keeps balloons inflated longer), and some without – to test how far in advance I could have the balloons filled, allowing me time to assemble the safety cone decorations. My balloons with Hi-Float added lasted for more than a week, so I knew I was safe picking up my balloons in advance. I picked them up 2 days before the party – all 60 helium-inflated balloons crammed into my Nissan Rogue with little room to spare! 60 helium-filled balloons, a 3 year-old’s birthday, and one crazy party-planning mom! The ties on my new blue balloons were baby blue instead of the teal blue I wanted, so to finish up my balloon saga, I spent that night clipping away, replacing the baby blue ribbon with the teal ribbon from my deflated balloons – something that was certainly NOT in my timeline! This party brought to you by cardstock, scissors, glue, and exacto knives. I used double-stick tape to secure the Cars characters to the sides of the cones, tied the balloons around the checkered flags and secured them to the inside of the cones (elevated and at an angle) using packaging tape. Close-up of the Cars characters on the right side of the entrance. Close-up of the Cars characters on the left side of the entrance. The birthday girl running through the theater’s balloon entrance after her party. The way the theater used only floor lighting once the movie started made the cones in the entryway look even cooler – each character looked like they had a spotlight on them! Theater lights out, spotlights on the Cars crew! Our Cars party “Piston Cup” centerpieces. I bought two large trophies from Oriental Trading Company (they were still pretty small though, FYI), added a mini “Kate is 3” sign to the front using double-stick tape, stuffed some floral foam inside and filled them with water and real red carnations. To give them a little extra height and drama, I also stuck two large checkered flags (the same ones I used for the balloon entrance) inside. The last bit of decorations were checkered flag pennants (from Oriental Trading Company) hung along the bottom of the theater screen and along the rail in front of the theater seats (seen in the theater pictures at the top of this post). The theater we chose (Sundance Cinemas) was so gracious to let us bring in our own snacks, water and juice for our guests (most places wanted to charge us an additional $5-7/person for a mini snack tray for the kids – on top of our theater rental fee!) so to respect them for their hospitality I wanted to make sure we stuck with mess-free finger foods. Sundance also has an amazing concession stand that’s more like a restaurant than a theater (they serve an impressive menu of food and drinks – it’s definitely not your typical theater!) and I didn’t want to take away from that, so we kept it light (and simple) with party snacks and told families in our invite that “light snacks and refreshments” would be provided and additional concessions and drinks were available for purchase at the concession stand. Our Cars-themed party food: Sarge’s Surplus Sandwiches, Mater’s Dip Sticks, Sally Stoplight Fruit Skewers, Fillmore’s Organic Flower Power Cake Pops, Luigi’s Tower of Tires, Guido’s Pit Stop Popcorn, and Flo’s V8 Cafe! Get it? Sarge runs a surplus store…and we had a surplus of peanut butter & jelly sandwiches! This was G’s DIY contribution to the party – he knocked those bad boys out in serious “Daddy of the Birthday Girl” style the morning of her party. Mater is a tow truck and I like to think there’s a dip stick connection there. For “dip sticks” I did sliced carrots and celery in little cups, some with ranch dressing and some with hummus in the bottom. For these I used a melon baller and balled watermelon for the red light, cantaloupe for the yellow (okay, fine, orange) light, and honeydew for the green light. It was my first time balling a melon and I’m not much of a fruit person so I was so worried about the fruit getting slimy or going bad if I prepped it too soon, so I balled those damn melons in the middle of the night sometime between 1am and 5am. In the morning (after the 2 hours of sleep I got the morning of Kate’s party) I threaded them through a lollipop stick which was blunt enough not to injure the mouths of the minimally coordinated little ones that’d be eating them. I was a little worried the whole “melon” thing wouldn’t go over well with the kiddos, but it turns out stoplights trump melon and these were gobbled up in no time! Fillmore is a free-loving hippy who’s all about organic fuel, so I was all about honoring him with all-natural, organic cake pops made by yours truly. Cake pops are Kate’s favorite, so they’re a must-have for her birthday party! They’re pretty easy to do, but incredibly time-consuming. To prevent myself from going crazy just before her party I actually made all the cake pops for her event back in November (her party was in January) and froze them until the big day. I used pastel pink coating for the chocolate cake pops and pastel yellow for the vanilla cake pops, and all of them were coated with flower power-shaped sprinkles. If you’ve seen the movie you know that Luigi sells tires and has a “Tower of Tires” out in front of his shop. I recreated this using mini chocolate donuts as tires, and this was such a hit with the kids! To make Luigi’s Tower of Tires, I used a small styrofoam circle, a long lollipop stick, and an old white cloth napkin. First I poked the long lollipop stick into the center of the styrofoam circle. Then I cut a little hole into the cloth napkin to fit over the lollipop stick and draped the napkin across my platter with the stick sticking out. I threaded mini chocolate donuts onto the stick and then piled them up on the platter. Easy as pie donuts! Guido is my favorite Cars character so I had to work him in somehow! I love his “pit stop” and I love popcorn, so the connection was clear. We brought a galvanized party tub, filled it (numerous times) with popcorn from the theater’s concession stand, and served it in little red & white striped popcorn boxes. The popcorn at Sundance Cinemas is so good that this tub was almost always empty (and G or I were almost always in the concession line) so unfortunately I didn’t get a picture of it with the bin filled, but you get the idea! The party beverages we provided were a tub of juice boxes and a tray of waters with personalized “Kate” Cars wrappers. In addition to what we brought, soda and alcoholic beverages were available for purchase from the concession stand, and you better believe this mama had a glass or two of Chardonnay to celebrate the party planning being both over, and a success! Our mini Cars lunchbox party favors. While most of our young guests got lunchboxes, they weren’t age appropriate for everyone so I wanted to label our favors for the sake of convenience. While working on the labels I got the idea of making them to look like Radiator Springs license plates, so that’s what I went with (loosely based off of the Wisconsin license plates I’m used to seeing). I lucked out in that most of our child guests were right around Kate’s age, but I did have a handful of kiddos in attendance that were either too young or too old to enjoy the lunchbox party favors. Because of this, our youngest guests took home a favor bag “kiddie” Cars goodies, and our oldest guests (teenaged) took home a favor bag filled with boxes of movie theater candy and microwave popcorn. I like (hope) to think that everyone left happy! Last but not least is the cutie-pie outfit our birthday girl sported on her special day! Her personalized Cars birthday party shirt is compliments of my friend Kent from Peachy Keen Designs – she did a wonderful job and I loved seeing my cars-loving girl looking so cute and happy on her big day! Overall, my goal for Kate’s birthday party was to celebrate Kate’s life with all of her favorite things, surrounded by all of her favorite people. I think there is something absolutely magical about birthday parties at this age, and I’m well aware that that won’t always be the case. She truly adored her day, and even two months later she continues to talk about, which makes me think this may be her first birthday party that she’ll have memory of. That’s amazing to me! My secondary goal of Kate’s birthday party was to simply celebrate children. I wish I could bottle up that awe and excitement that each child experiences when it comes to a birthday party! Other than her picture slideshow, her name on the decorations and the fact that her parents were paying the bill, this year’s party could have been any guest’s birthday party, and that means so much to me. I was so excited making each child’s VIP Pit Pass thinking of how special they’d feel wearing it. I was all smiles making cake pops thinking of all the kids (and parents!) who would happily devour them in two bites or less. And I envision kids on this very day packing up treasures in their mini Cars lunchbox and proudly parading them around the house. I love celebrating my daughter. That is why I love doing this! Want to see more? 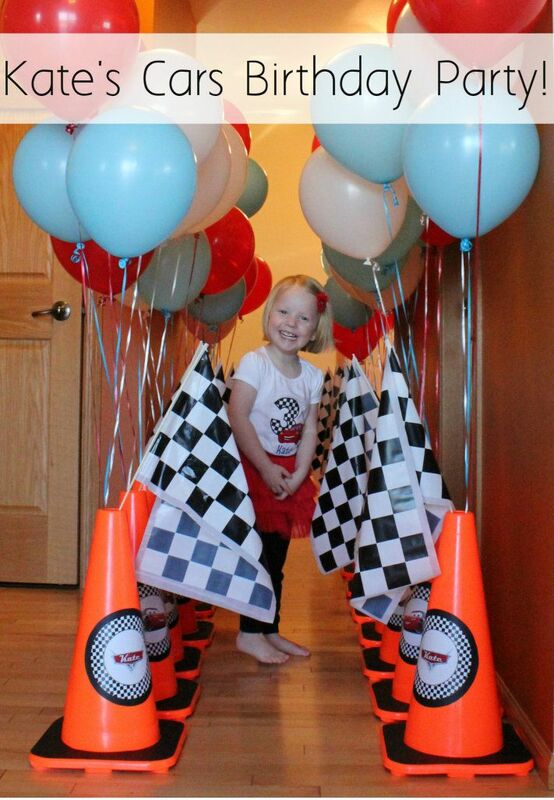 Check out Kate’s Cars Themed Birthday Party post and my FREE Cars Birthday Party Printables! Hi Dusty, I recently started reading your blog but haven’t commented before. I just wanted to say that the party you threw for your daughter looks amazing! The love and thought that went into it brought tears to my eyes – I have a 14 week old son and can’t wait to do the same for him. Thank you so much, Jo! You are too sweet. Congratulations on the arrival of your son! His first birthday party will be wonderful, I’m sure, but hopefully it doesn’t come too quickly! I need a pause button for Kate – she’s growing up too fast! They were just regular sized traffic cones – what people would use for out on the street. Just BEAUTIFUL!!! So creative! I’m in the planning for my son’s Thomas the Train 2nd Birthday party in July and I’m loving every minute of it. I totally understand when you say you love celebrating children. Great Job!!! Thank you so much Lateasa! Party planning is so much fun, don’t you think?! Good luck with your son’s Thomas the Train party this summer! Kate is also a huge Thomas fan – you’re going to have a blast with that theme! HOLY SMOKES….consider me BLOWN AWAY. I found your blog via Roo @ NiceGirlNotes a couple weeks ago and have been so impressed at all your party planning. Can we be friends? I promise I will bring wine to these parties haha. Anyone who brings me wine is instantly my BFF. Kate goes to bed at 7pm – I’ll expect you here at 7:01! Still in awe of this party!!! Thanks for the breakdown, this was so much work for you!! (and hats off for DIYing all that paper stuff – you did an awesome job!) But like you said, its worth it. I’m also still psyched that another girl loves Mater and Queen as much as Maura does!! Doesn’t it make you love your kid even more? That they’re a girl into cars?! Awesome. Thanks girl! YES. I totally get what you mean about our girls. I absolutely adore that Kate is into cars and trucks and trains and construction sites! I love that her interests and her play are so pure and genuine. She has the rest of her life to be concerned about gender stereotypes and self-image – I’m not about to rush it! Hello, Dusty! I stumbled upon you blog when I was looking up birthday party ideas for my son (he’ll be one in a few months). Like everyone here, I’m blown away by the love, creativity, and effort that went to Kate’s parties. She’s very lucky to have you as her mom! Thank you so much, C! I make the cake pops from beginning to end (chocolate coating and all) before I freeze them. I wrap the top of each pop in a little candy baggie, tie it with a twist tie, and put them in a freezer bag to freeze. When you’re ready to eat one (or all of them) simply remove them from the freezer and keep them at room temp for about 15 minutes and they’re ready to eat! (You can also thaw them in the fridge if you’d like, but I’ve found it is not necessary.) Good luck with your son’s party! Incredible! Looks like a party that children and adults alike would enjoy. Great job! And yes, party planning is soooo much fun — exhausting, but totally worth it! Absolutely, Carla B! Thank you! Hi Dust! I loved everything that you did for your daughter’s birthday party. I would like to know if you are willing to e-mail me your creations to use it for my son’s 3er birthday party. Hi Liv – I’m going to try to post my printables on my blog for all to use, but in the meantime feel free to email me and I’m happy to help! Hi, this is incredible! I am going to use you for my inspiration in planning my son’s Cars-themed party! I am just wondering, did you make the tags that go on each of the snacks? Or, were you able to buy those somewhere? Thanks so much! Hi Leanna – thank you for your sweet comment! To answer your question – I made the food tags using Microsoft Publisher. Nothing fancy, but it gets the job done! I am so excited I stumbled upon your blog! I’ve been searching high and low for “Cars” themed ideas for my girl! Looking forward to recreating some of your fun ideas! Where did you get the little card holders to hold the signs for the food? Really great job on everything! I absolutely love this party!!! It looks like it was blast for everyone!! Cars is the theme for my sons birthday this year and I was just wondering if you would be willing to email the printables that you did? Thanks so much!! Are you willing to share the files for the printable signs, etc. that you used for your party? I would LOVE to use them! This party looks AMAZING! I love all the extra details! Thank you so much for sharing all of your great ideas. My little man is all about Cars too and he is turning 4 in August. I was wondering if there was any way you could email me the pit pass for the lanyards. My son would LOVE these! Thank you so much! your ideas were great!!! loved reading this post on how you planned everything. would it be possible to email the route 66 logo? i would love to use the same idea for a banner for my son’s 3rd birthday. thanks! I’m new to Pinterest (which is where I found you) but have always enjoyed expressing my love to my kids by going all out (effort and detail, not expense) when planning for their birthday parties or other special life milestones. My son Camden’s 3rd birthday is coming up at the end of July and he’d love a Cars themed party. Normally, I’d brainstorm and plan far in advance, but my youngest brother got married last weekend which zapped most of my time and creative energy. So, a couple of days after the wedding, I decided to check out Pinterest to see if it could help me with party planning ideas and I was instantly hooked! Despite signing up for Pinterest a couple months ago, I didn’t really know what it was all about and hadn’t explored it at all until now. I can’t believe this great sharing pool of ideas has been at my fingertips and gone unused. I stayed up until like 2am one night pinning everything (got way sidetracked from the Cars search I started with.) Lol! Eventually I refocused and stumbled upon your AMAZING Cars party that you had for your daughter Kate! I loved it. All of the attention to detail blew me away! I truly believe that the special memories we create for our kids when they’re young, make them feel deeply valued and loved, and those feelings then last long after the party is over, contributing to the overall person they will grow to become. Kate is a lucky girl to have a mommy like you who cares so much. Anyhow, I saw another person ask you about the signs and pictures from the party and you saying you’d post them as free printables. Is that something you’ve already done that I just can’t find? If so, can you direct me to exactly where that is? If not, are you still planning to post those? Obviously, it’d be like a mini lotto win to get my hands on those before his party if you are willing to share them. If not, because of time constraints or for whatever other reason, that’s fine too. Just let me know either way please. Regardless, I still had to comment to simply say how much I enjoyed reading your post and how truly inspired I felt by your ideas for Kate’s Cars themed party! Thanks! Hi Peggy – I just sent you an email. I made all of the printables myself and am happy to help you with whatever you need! Hi Jeanne – thank you so much for your sweet comment! Isn’t Pinterest addicting? I emailed you back today – I hope you got my message. Good luck with Camden’s birthday party later this month – I’m happy to help with whatever you need! Hello! Just when I thought, I have read all the blogs about Cars Theme birthday party, I stumbled upon your site. You did a very good job. I wish my children and I were at your little girl’s party. I’m sure my 3 boys will have the time of their lives. Is it okay to copy some of your decorations? Especially the VIP Pit pass. Is it okay to copy it as it is? Hi Ritz, thank you so much for your sweet comment – I wish you and your boys would’ve been at Kate’s party, too! Feel free to copy whatever of mine you’d like for your son’s upcoming party. All I ask is that you credit my blog as the source, please. I’m almost finished converting the printables I made for Kate’s party for widespread use and hope to have them posted on my blog next week, so look for those coming soon to save yourself some time! What an awesome party! I hope my sons 3rd birthday which is cars theme is just as amazing! Are you able to share your printables please. Can u email me? Thank you so much, Stacy! I’m planning to publish a post with my Cars party printables this Wednesday, so look for them coming soon! Thank you so much, Luz! Look for my Free Cars Birthday Party Printables post to publish in the morning! Thank you, Dusty! When I found out that I have Microsoft Publisher in our laptop, I started searching for tutorials. Now, I’m almost done with the party invitation. I kept checking your blog for inspirations as I am not a creative person.And yay! for the printables… Not only it will save me some time but the decorations would look more awesome compared if I will be the one to do them. I will credit your blog, for sure, for all the posts I am going to make. Facebook and on my upcoming blog as well. Thank you very much again. Regards to your pretty little princess. My pleasure, Ritz – I’m happy to help! Good luck to you with your little one’s party! Thank you so much for putting all the pictures and templates of Kate’s 3rd birthday, cars theme party on website. It was so lovely to read and enjoy the photos. I have been thinking for sometime about my son’s 6th birthday as its more a celebration of life. He had leukaemia when he was 1year old and is now in his final months of remission. your blog/website has made preparing for this life celebration so much easier and FUN. It is also such a delight to having him here and involved in preparing for his birthday too. Dusty…..All I can say is WOW. I am helping my daughter plan my grandson’s 2nd birthday party and we are using the Disney Cars theme. Your site has given me all the inspiration I need so I thank you so much. I do have one question though…..in order to make Bryson’s birthday banner, I need some blank route 66 signs so I can type his name into each one. I can’t figure out how to use the PDF you are providing and type over the letters that are already there. You’ll have to forgive me because I’m really not computer saavy. Again…..thank you so much for sharing your incredible imagination and talent with those of use who really need the help!!!! My daughter will be 3 in April and she LOVES Cars! Ever since you did this post I had it in mind for her birthday. You did an amazing job and if we settle on a Cars theme (she’s obsessed with that and bees right now, so we’ll see where we end up) I will be sure to give you all the credit! Thank you so much for going into so much detail regarding the decorations. Again, you did an amazing job!! Thank you so much, Desiree! I’m sure your daughter’s party will turn out beautifully no matter what she decides. Have fun! Hi, i really like how you did your daughters party, it looked amazing. I was wondering if you could tell me what size you got the badge holders and where you bought them please. I loved your daughter’s party!!! It looks amazing. I am planning a cars birthday party for my son and wanted to ask you where did you get your daughters T-shirt. I would love to get my son one of those for his birthday party. Thank you so much! Dusty-any chance you could send me the exactly food labels you used for Kate’s party? My Jack is crazy about cars and I can’t wait to pull this off for him!!! Hi Kolby, I’m so sorry, but my computer crashed and these files were corrupted. The only thing I have now are the pdf’s I uploaded to my printables post: Hopefully those will work for your son’s party. Happy birthday to him! i love all the ideas for the party. my sons 2nd birthday is this weekend and I love all the printables but don’t know where to go to get them personalized with his name age and the characters for the foods. any help would be amazing. I love your blog and will be back!!!! Hi Megan! My best suggestion would be to find Cars stickers to add to the printables to personalize them. Or try Etsy – that’s where I got the personalized Cars logos with Kate’s name on it. Good luck with your son’s party! I’m trying to edit the food labels that you linked to and it’s not letting me. All I can do is print the labels with just the checkered top on them. I too am doing the exact foods you did minus the cake pops. What am I doing wrong? My 4 year old is super excited about his upcoming Cars party. Thanks so much for the ideas! Hi Carla! The labels are pdf’s so I think you’d like some kind of pdf editing software to be able to edit them. Or it’s possible you could do it in Photoshop if you upload the pdf there. Good luck with your son’s upcoming birthday party – I’m sure he’ll have a blast! I just ran across your blog on Pinterest and I’m ecstatic to have so many ideas I think I can actually accomplish for my son’s 3rd birthday party. I do have a question however, what size pass holders did you find at Staples? I’m having a hard time visualizing a 3″x5″ pass but I can’t seem to find anything larger. Any tips? Hi Nicole – I’m so happy to hear you found this post helpful! I don’t remember the exact size of the VIP passes I made, but I do remember they were the vertical name tag holder size from Staples. Also, did you see my post for Free Cars Birthday Party Printables? Those print outs are the exact size I used. Good luck with your son’s 3rd birthday party! Im glad to hear about your successful party for kids. This is a good idea for all moms out there. Adorable party! How did you go about renting the theater? Was the party at a time that the theater is not typically opened? Do you mind me asking how expensive it was to rent? Thank you so much, Patty! We rented out the theater during their regular business hours, so there were other movies playing in other theaters around us. It was likely a low traffic time of day/day of the week, though. I can’t recall how much it cost us to rent it out, but I do remember that it was cheaper than most of the typical birthday party packages in our area (like the bouncy house places, zoo, etc.). The best advice I can give you is to just get on the phone and call around. I called every place in town before I found someone willing to work with us, and I was so appreciate that Sundance was willing to have us. It was such a fun party! Hi Dusty. I love the birthday decorations you did for your daughter. I wanted to see how I could do the part of the banner that has your daughters name. I need it to say Kaleb. Also to do one for 2nd!! If you could help me with this on how to do it I would greatly appreciate it!! Thanks so much for this! My daughter is obsessed with all things cars. She is turning 3 in July and really wants a Cars themed party.